The best fall weather occurs when you can feel the warmth of the sun and a cool breeze at the same time. Days like these immediately lift my mood and bring about a sense of nostalgia for the easy days of summer. This kind of weather also calls for layering, but in a way that is much more comfortable than the bulkiness of winter ensembles. One of my favorite layering pieces for the fall is this beige duster coat. As the warm-weather predecessor of the trench coat, it is lightweight, easy to wear, and versatile. What I love about this particular piece is that you can opt to roll the sleeves up or down depending on the weather. If you're looking for the ultimate everyday coat for early fall, a duster coat can't be beat. What is your go-to piece for the season? Aw thanks so much Vivian!! I actually miss the summer weather haha. Hope it cools down for you soon though! Wow, this is actually amazing!! I hope I'll be seeing these around everywhere in the future, love the concept! 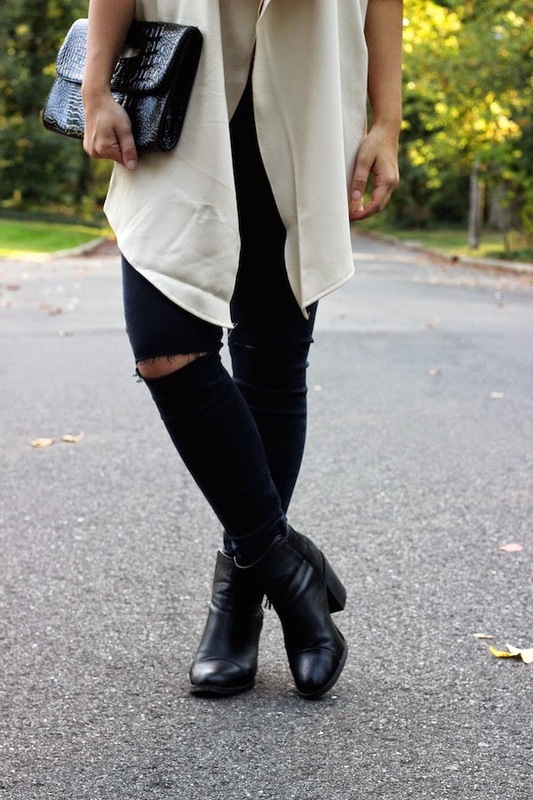 Hey I have a very similar flowy trench thing from Sheinside! Haven't worn it on my blog yet because it's still too hot over here. Love how you styled yours! You have to get them! They're so comfortable! Love that jacket! You styled it so perfectly! Oh this is a perfect outfit! Love your coat so much and I love everything! Such a cool look, love your style! The jacket is awesome! This jacket is awesome and you've combined it so greatly! Absolutely in love with that jacket! Looking good girl! Your outfits are so chic as always, Christina! I love how that trench that you're wearing; it looks so light and thin which is a perfect transitioning outerwear for the autumn! Have a lovely week ahead of you, Christina! Aw thank you so much Diane! !